November 30th 2014-Peotone finished with one of the coldest Novembers ever. Yet there was only 0.7 inches of snow. October 31st 2014-First measureable snow of the winter! October 4th 2014-First snowflakes of the winter fell between 8-10am. No accumulation. September 30th 2014-September will close with 5.32 inches of rain. This is 1.86 inches above the 30 year normal (1983-2013). For the year we are running 9.57 inches above the same 30 year normal. For the year we only have 10 days that the temp reached 90F, and 89 days that the temp reached 80F. September 20th 2014-56 mph wind gust durring a severe Thunderstorm. The storm produced 1.26 inches of rain, of which 0.75 inches fell in 7 minutes. September 09-10th 2.07 inches of rain fell. August 25th 2014-59mph Thunderstorm wind gust was recorded at 2:14pm. The high winds were accompanied by 1.17 inches of rain. Prior to the rain we had our 10th 90F temp of 2014. The heat index hit 113F. August 21st 2014-67mph Thunderstorm wind gust was recorded at 5:41pm. This was the strongest wind gust in town since the microburst in 2006. The strong wind gust this time was NOT a microburst. 0.85 inches of rain fell in about 20 minutes! Multiple large tree branches (8 inch diameter) down around town. Power was knocked out in parts of town with tree branches taking out electric lines. There was minor damage to a couple rides at the will county fair (no injuries). July 12-13th 2014-2.44 inches of rain fell. June 30th 2014-1.77 inches of rain fell. Also two Bow Echo thunderstorm complexes moved through. Both lines of storms caused heavy rain, frequent lightning and high winds. The peak wind gust in town was 56mph. Power to parts of town, like the Gull Landings subdivision, was knocked out for 3 days! June 18th-21st 2014-5.92 inches of rain fell. May 11th 2014-Strong Thunderstorm hits Peotone. 52mph wind gust at 6:14pm. Feb 20th 2014-Poweful storm moves through the area. In the morning we have thunderstorms producing over an inch of rain before 8am Followed by fog as warm air moves in over the snow pack. Which is to blame for a 20 car pile up on I-57 by Peotone, which made national news. Then in the evening the cold front pushes through with 35-45mph winds all night. Total rain for the day was 1.32 inches. A day before the storm Peotone had a 17inch snow pack. The day after it was down to 7inches. Thats a 10inch loss in 48hrs. Feb 18th 2014-7.1 inches of snow! 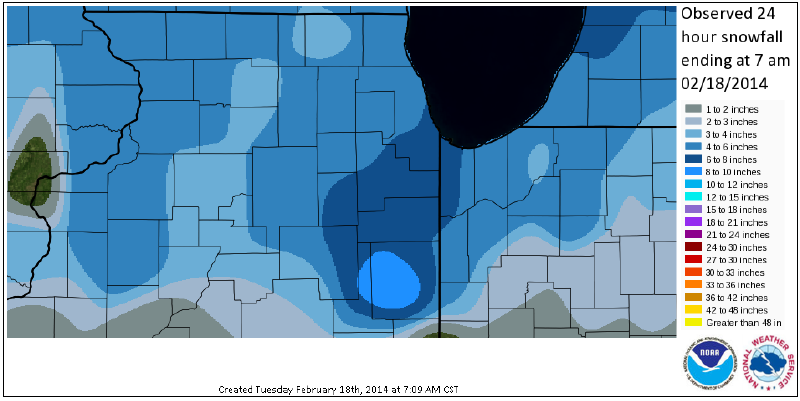 See Graphic below for Chicago Metro totals. Graphic provided by the NWS Chicago. February 4th and 5th 2014-5.2 inches of snow! January 31st and Feb 1st 2014-6.6 inches of snow! 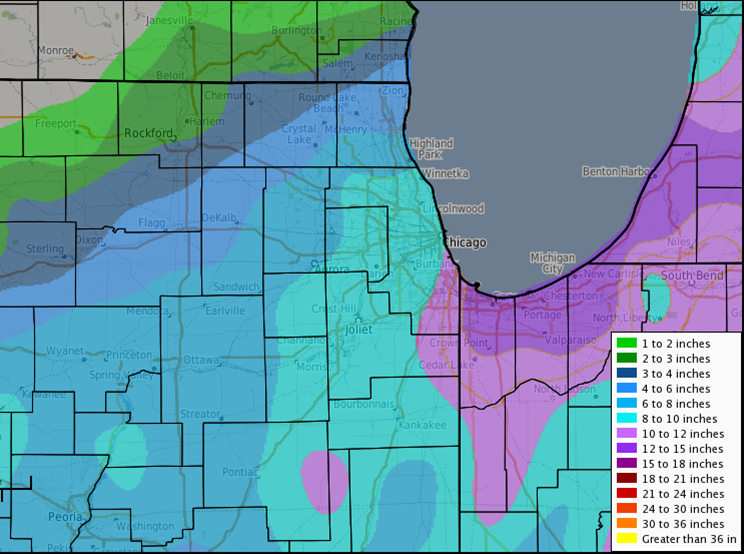 See Graphic below for Chicago Metro totals. Graphic provided by the NWS Chicago. January 6th 2014- Low temp last night of -14F. That is Peotones coldest temp in the last 5 years. Windchill hit -45F, that is a record for peotoneweather.com! January 4th and 5th 2014- 8.5 inches of snow. Largest snowfall in 3 years. See Graphic below for Chicago Metro totals. Graphic provided by the NWS Chicago. January 3rd 2014- Low temp last night of -08F. That is Peotones coldest temp in the last 3 years. January 1st 2014- In 2013 we recieved a total precipitation (rain and melted snow) of 41.60 inches. Normal precipitation for the year is 40.46 inches. We finished with a deficit of 0.86 inches.